Everyone else is either reading The Metro or playing Monkey-Tennis on their smart phone (apart from the girl sat opposite me who has her face in in a Greggs pastie) and I’m sitting here with tired eyes and a laptop, plotting my course through this weeks #OneBlogaWeek. Interview with BBC Radio 5live. The London show on May 3rd is now officially sold out, which is mental! I try not to get too wrapped up in these things but when I think back to a year ago, the prospect of selling out a 300+ capacity show (not to mention more than 3 months in advance!) was less of a prospect and more of a pipe dream. Needless to say I’m sat here looking at the possibility of adding in another London show and smiling my little socks off. 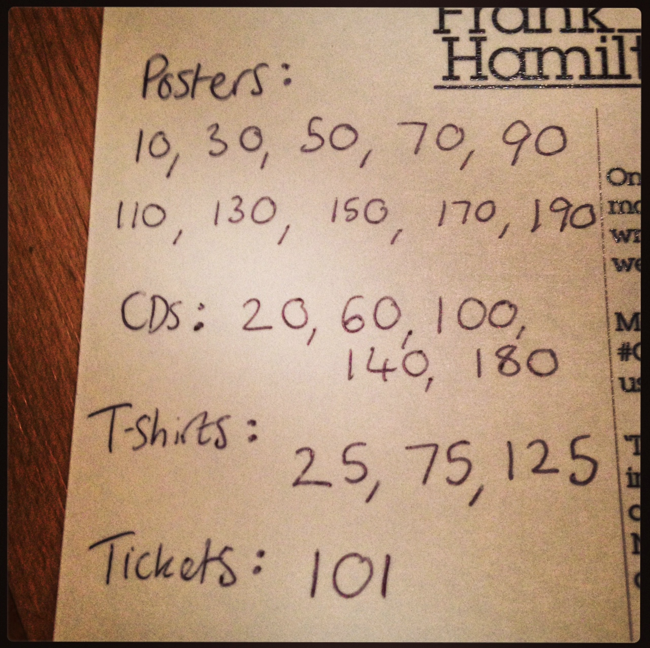 The rest of the tour is almost finished (just waiting for a few more ticket links) and you can find all the ticket info on frankhamilton.co.uk (click on the logo and then go to the live section). On Monday I posted a competition/raffle on Facebook asking people to pick a number between 1 and 200… 517 entries later, here we are! I’ll post on Facebook tomorrow with the corresponding winning names and tell you how to get in touch if you’ve won! 4) My next silly idea. You and eye are going round in circles. Got it?! More details next week. Until then, enjoy yourselves (and each other). FYI The numbers were written before the competition and put in an envelope (so it was fair).